Safety footwear is essential if your work involves handling heavy materials, or if you work in a workplace with uneven surfaces, in the vicinity of machines as a craftsman or in an industrial area or warehouse. Here at MASCOT you can find the MASCOT® FOOTWEAR CLASSIC collection, which is a collection of traditional safety shoes and boots that are adapted for work both indoors and outdoors. The shoes in this collection are an excellent choice for anyone working in the construction industry as a carpenter, contractor or fitter. Safety shoes and boots in the MASCOT® FOOTWEAR CLASSIC collection are made from flexible materials which ensure great walking comfort. At the same time, foot stability is always ensured on uneven surfaces and stepladders thanks to a small stiffening insert in the back part of the sole (a so-called shank). All safety footwear in the MASCOT® FOOTWEAR CLASSIC collection includes ergonomic toe caps for extra protection of the toes and increased freedom of movement. For increased comfort and protection against the cold, safety shoes in the CLASSIC collection also feature textile midsoles. This type of midsole covers a somewhat larger area than a classic midsole and thereby offers better protection against nails and other sharp objects on the ground. 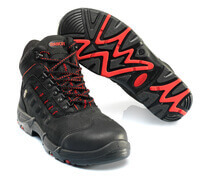 In addition, the MASCOT® FOOTWEAR CLASSIC also features a stabilising shank, heat resistant soles made from PU/TPU, ladder grip and very durable TPU toe reinforcement which gives the safety footwear an extra long service life and makes the shoes particularly well-suited for work in kneeling positions. Opt for MASCOT® FOOTWEAR CLASSIC if you want safety shoes that are classic in appearance, with a natural look and a focus on safety aspects. 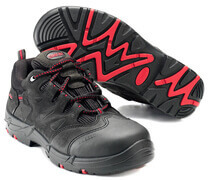 All safety footwear in the MASCOT® FOOTWEAR CLASSIC collection is approved in accordance with EN ISO 20345:2011. Many of our shoes and boots meet the requirements of the highest safety class (S3) which means that in addition to midsoles and toe caps, they are also slip resistant, shock-absorbing, anti-static, breathable, water-repellent and equipped with an oil and petrol resistant outer sole. MASCOT® FOOTWEAR CLASSIC is therefore a safe and classic choice if you want a good quality safety shoe with a whole host of great features for the best possible protection of your feet.